Looking for a new mattress in the Colorado Springs area? We’ve put this guide together to help you. Your mattress is the most important piece of furniture in your house. You can expect to spend one third of your life sleeping, and it’s no secret that sleep quality impacts your mental and physical well-being profoundly. Studies show that 90% of adults reporting excellent sleep say that they are “very effective at getting things done” in their daily lives, while just 45% of those with poor sleep can say the same. In addition to those all-important nightly 8 hours spent sleeping, you probably log additional hours in bed relaxing, reading, cuddling with pets or loved ones, or just curling up to watch movies. In fact, some of the best hours of your day may be spent relaxing in bed, and you’ll certainly want to spend them in comfort. With that in mind, a mattress is not only your most important piece of furniture, it’s also an important contributor to your daily functioning, comfort, well-being, and quality of life. If you believe in the importance of a good mattress, then you may be considering a new one to replace your old mattress or to upgrade to a better model. When it comes to mattress shopping, though, you may be unsure where to start. If you’re wondering where is the best place to buy a mattress in Colorado Springs, we’ve got your back. 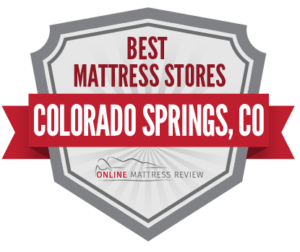 Our guide to the Best Places to Buy a Mattress in Colorado Springs lists the best of the best, sourced from a variety of online review sources and all grouped by neighborhood. Read up and find a convenient source for a new and better mattress, and experience the benefits to your health, mood and well-being. Of all the places to buy a mattress in Central Colorado Springs, Mattress By Appointment (4529 E Platte Ave) has the highest customer ratings, with an average review of 5 stars. As the name implies, the store has no regular hours, and customers need to make an appointment to browse the store’s wide selection of popular brands such as Serta, Beautyrest, Sealy, and Simmons mattresses. With no advertising, staff or regular hours of operation, the store maintains an incredibly a low overhead, allowing Mattress by Appointment to offer discounts of 50%-80% off retail. Leading national chain, Mattress Firm, has two stores in Central Colorado Springs: Mattress Firm Knob Hill (1006 Academy Blvd N) and Mattress Firm Citadel Crossing (703 Academy Blvd N). Finally, Peak Furniture (2438 E Platte Ave) has a four-star average n Yelp, and a wide selection of affordable furniture and mattresses. This locally-owned store has been in business since 2001, and shoppers can find affordable mattress here from trusted economy brands like Ashley, SierraSleep and Southerland. The most highly-rated place to buy a mattress in North Colorado Springs is America’s Mattress (7445 Academy Blvd N). The store has an incredible variety of mattress in stock, including coil, foam and hybrid models from top brands like Beautyrest, iComfort, Perfect Sleeper, Sertapedic, and their own, in-house brand of affordable mattresses. As with Central Colorado Springs, Mattress From has multiple locations in the North of the city as well. There is Mattress Firm North Academy (7130 Academy Blvd N), Mattress Firm Chapel Hills West (7784 Academy Blvd N), and Mattress Firm Clearance (5408 Academy Blvd N), each averaging at least 4 stars in Google reviews. For those with back problems, Relax the Back (1234 E Woodmen Rd) is the ideal place to shop for a mattress to provide long-lasting relief. This specialty shop offers ergonomic furniture and mattresses designed to provide relief to those with back injuries, chronic pain, sleep apnea and other conditions requiring special support. Shoppers here can choose from a variety of Tempur-pedic and therapeutic gel mattresses, as well as specialty sleep products like elongated and wedge-shaped pillows, massaging beds, and adjustable bases. Denver Mattress Company (6320 Corporate Centre Cr.) sells a variety of popular mattress brands, as well as “Doctor’s Choice,” the company’s in-house brand of affordable mattresses, and their most popular product. There are just a few places to buy a mattress in South Colorado Springs, but all are highly reputable. Bob’s Discount Mattress (1791 S 8th St), one of the highest-rated locally owned and operated mattress stores in Colorado Springs. Bob’s has highly affordable mattresses from Simmons, Serta, Perfect Sleeper, and iComfort, and offers fast local delivery. Reviewers on Yelp and Google give this affordable mattress shop an average of 4.5 stars. Those who prefer the wide selection of a national chain can try Mattress Firm Cheyenne Mountain (1670 E Cheyenne Mountain Blvd), Mattress Firm Colorado Springs (1785 E Cheyenne Mountain Blvd), or Mattress Firm Clearance (1795 E Cheyenne Mountain Blvd). Colorado Discount Mattress (2849 E Fountain Blvd) boasts a 4.7 star average Google rating. Reviewers praise this local mattress shop’s outstanding customer service and selection. Prices are low, and the store also offers an additional military discount. Denver Mattress Company (4331 Integrity Center Point) has another store location in East Colorado Springs. Here, customers can find premium beds like Tempur-pedic and Vispring, natural models from Green Choice, as well as highly affordable mattresses under the store’s now Doctor’s Choice Line. Reviewers give this location a 4.5 star average rating on Google and Yelp, praising the store’s staff of sleep experts for patience and expertise. Staff are trained to provide shoppers with a custom mattress fitting based on a series of in-store tests of body type, preferred sleep position, and other factors. Multipurpose stores are the most common places to buy a mattress in West Colorado Springs. As the name suggests, American Furniture Warehouse (2805 N Chestnut St) sells both mattresses and furniture, both at affordable prices. The store has been in business since 1975, is open 7 days per week, and conveniently remains open until 10 pm every day except Sunday. American Furniture Warehouse’s Sleep Center features a wide selection of mattresses, box springs, foundations, bed frames, pillows, adjustable bases, comforters, and sleep accessories. The selection includes everything from innerspring and memory foam mattresses to specialty sleeper sofa mattresses and futon mattresses. Another option in the area is Appliance Factory and Mattress Kingdom (680 W Garden of the Gods Rd), which has a 4.5 star average customer review. Appliance Factory & Mattress Kingdom is Colorado’s largest independently owned appliance retailer and the 28th largest appliance dealer in the nation. Here, customers can score significant savings on mattresses, as well as appliances, with models at every price point including isolated coil, linked coil, latex, memory foam, and gel foam, from popular brands like Sealy, Simmons, and Tempur-pedic. The store stands by its low prices, promising to bead any competitor’s price on an identical product within 30 days of purchase. That wraps up our guide to the best mattress stores in Colorado Springs. Happy shopping!